Welcome to the fabulous Lyric Theatre at London! The stunning Westend Theatre is currently running as well as advance booking of some of the finest London shows, such as Thriller Live, We’re Going on a Bear Hunt and The Gruffalo. 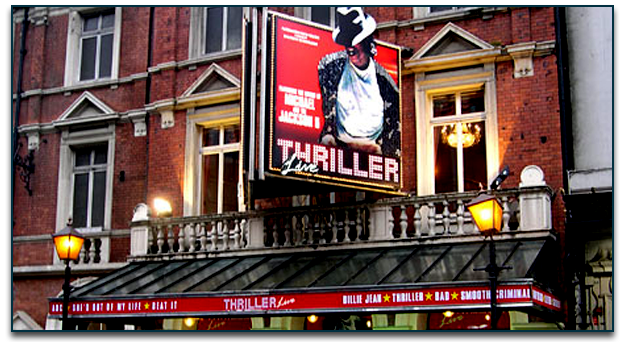 The feel good uplifting London musical Thriller Live is one of the finest shows featuring unmatched and incredible choreography and sensational musical numbers by Michael Jackson. The show has revoked the magic of world’s greatest entertainer. Another popular show ruling the box office at lyric theatre is the happy happy family of We’re Going on a Bear Hunt. The interesting journey of a sweet family is a must watch and also a big hit amongst the theatre goers. You can enjoy both of the thrilling and joyful London shows at the opulent Lyric Theatre. Lyric Theatre is a popular Westend Theatre and is positioned on Shaftesbury Avenue in the City of Westminster. Architect C J Phipps designed the theatre which was constructed by the Henry Leslie. The latter is the producer of Alfred Cellier and B C Stephenson’s blockbuster Dorothy and he built the theatre with all the profits he earned from the show. Lyric Theatre was the second theatre which was built on the Shaftesbury Avenue and is currently the oldest as well. In the year 1932-33, the foyers and bars were renovated, whereas façade was restored in the year 1994. The current occupancy of the Lyric Theatre is 967 and is spread on four levels. The original occupancy of the theatre was 1306. Interestingly, Lyric Theatre has retained its old world charm and uses electric pump to function the iron curtain. The early years of theatre witnessed comic operas followed by light comedies, musicals and dramas. On September 1960, theatre was listed by English Heritage as Grade II. Some of the popular productions at Lyric Theatre are Dorothy, The Mountebanks, Florodora, The Girl in the taxi, Whirled into Happiness, His Excellency, Hairspray, Thriller Live and many more! The recently released fabulous production photos for the brand new West End cast of the one of the most sensational London musical Thriller Live is simply awesome. The announcement has been made about the new booking period through to 30th September, 2018. The concert style spectacular London Westend show, Thriller Live is all set to overtake another wonderful jukebox musical, Jersey Boys on 15th February 2018 and will become the 14th longest running musical of London Westend. 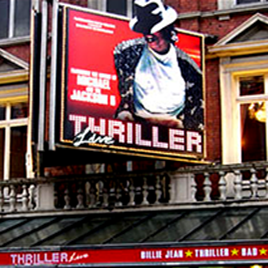 The magnificent London musical, Thriller Live is one of the most loved saga of the greatest entertainer, Michael Jackson’s brilliant musical legacy and superb dance moves. The show is all set to celebrate its 4000th performance on 19th August, 2018. The new cast of Thriller Live stars Charlotte Berry, Vivviene Ekwulugo and young MJs Giles Corden and Christian Posso, David Jordan, Stefan Sinclair, John Moabi, Haydon Eshun, Alex Ko, Cordell Mosteller, Reece Bahia, Shakara Brown, Ella Coghill, Aisling Duffy, Ella Redhead, Sophie Usher, Emma Smith, Jorgia Vaughan, Brett Baxter, Peter Cleverley, Jamal Crawford, Joel Ekperigin, Jamie Mason, Florivaldo Mossi, Ashley–Jordon Packer, Aled Arhyel Charles,Marcellus Virgo Smith, AndreFaulds, Iasiah Mason. The show is undoubtedly one of the most brilliant show as has enjoyed three acclaimed UK tours and standing ovations across Europe. The high octane show, Thriller – Live is one of the most loved and popular shows and celebrates Michael Jackson and the Jackson 5. The sensational dancing musical, Thriller Live brings distinctive sound of the Jackson’s greatest hits live on stage along with eye-popping multi-media effects and award winning director’s alluring choreography. He has worked with some wonderful actors such Leona Lewis, Will Young, Robbie Williams, Kelly Clarkson and Girls Aloud. Five-time MTV award-winner LaVelle Smith Jnr. has provided additional choreography. The greatest entertainer of all time, Michael Jackson has a career more than 40 years with more than 100 million sales across the globe and 1 billion total sales. The sensational show Thriller Live features two hours of non-stop hit songs and presents the awesome spectacle of legendary performances of Michael Jackson. The hugely loved and popular production by Theatre company Tall Stories, The Gruffalo is all set to make its return to the London Westend. Based on the immensely loved children’s classic, the magnificent show features scintillating musical numbers along with high energy production. 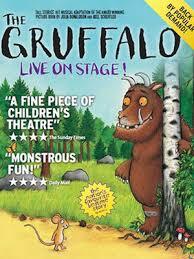 The enchanting London musical, The Gruffalo is penned by Children’s Laureate, Julia Donaldson. The show has been voted as the hugely popular bedtime classic by BBC Radio 2 listeners. Million of people from all across the world have enjoyed the brilliant stage production. Various animated television versions have been also inspired from the show. The national tour role of Mouse is reprised by Josie Cerise along with Owen Guerin as The Gruffalo. Tim Richey played the colourful predators like Owl and Rattlesnake. The fifty minutes long show is a memorable experience for the kids as well as people of all age groups. Catch the blockbuster London show, The Gruffalo at Lyric Theatre. Get set for the arrival of highly anticipated sequel, The Gruffalo’s Chlild at the magnificent Lyric Theatre! The enchanting London musical, The Gruffalo has enjoyed huge success. The brand new popular show is adapted from Julia Donaldson and Axel Sceffler’s award-winning children’s picture book. The spectacular magical stage adaptation is a beautiful amalgamation of wide range of colour, songs and fun! The show is set against the backdrop of wild and windy night and revolves around the Gruffalo’s child who enters into the forest. Her father has also warned her about the Big Bad Mouse! When she spots some mysterious tracks in the snow, The courageous little Gruffalo finds some mysterious tracks across the icy forest and also encounters number of naughty predators looking for delicious snack. The Gruffalo’s Child is a beautiful London Westend show featuring wonderful performances from Sophie Alice as the Gruffalo’s Child, Catriona Mackenzie as the Narrator/Mouse, Andrew Mudie as the Gruffalo/Predators and Jake Addley understudying. The popular Tall Stories have enjoyed successful tours across the country. Under the superb direction of Olivia Jacobs, the show features stunning choreography by Morag Cross, design by Isla Shaw, lighting design by James Whiteside. The show also features chartbusting and brilliant compositions and lyrics by Jon Fiber and Andy Shaw. 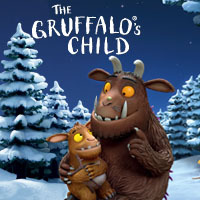 The Gruffalo’s Child also features puppet design by Yvonne Stone and Polly Lawrence. The Gruffalo’s Child is a complete package of mesmerising puppetry, great songs and gripping storytelling. The show is all set to make its debut at the London’s Lyric Theatre. The show will run for limited season from November 22nd 2017 to January 7th 2018.